Anyone can start a blog these days, but to make that blog successful requires a certain level of dedication that only a few driven people possess. 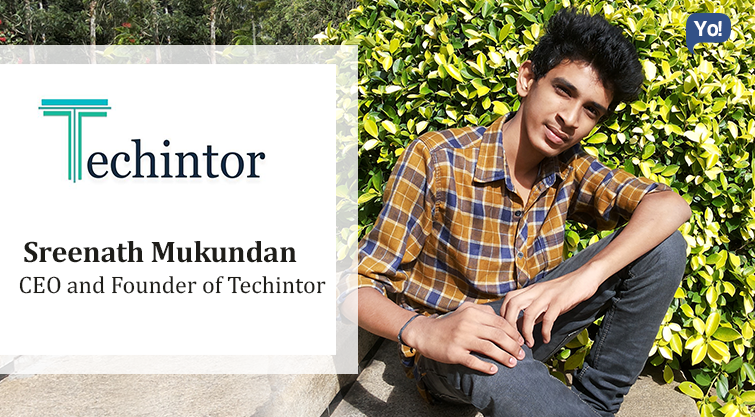 Sreenath Mukundan is one such individual who is passionate about learning tech things and educate online readers about them through his blog, Techintor.com. He started blogging as a school kid, and despite numerous failures his passion for technology and hunger to keep learning kept him going. Now a Computer Science Engineering student, today, Sreenath runs his blog successfully, which enjoys traffic of over 12K users on daily basis. Read on to learn more about this young gun and how he reached where he is today. Techintor is a trending tech blog. On Techintor, I share trending tech articles, network tricks, android tweaks, online shopping loots and PC tweaks. We are more concentrated on network tricks. We will find network loopholes and share it with users through techintor.com. Along with techintor.com, I have other websites in various niches that provide services like SEO, web page designing & blog setup. My life events and achievements are my inspiration. I born in a middle-class family and struggled very much to get money for my needs when I was a child. I love computer very much and have the keenness to learn computer & IT related things. At the age of 11 my father bought a second-hand computer for me because of my daily request for the same. Since it was a secondhand computer I met many problems while using it. During that time, I tried to repair it myself and gradually studied some basic computer hardware. My school also helped me learned a lot about computer and other IT related things. I was student IT coordinator there. I participated in the Webpage designing competition when I was in 8th standard, and that turned out to be the turning point in my life. I couldn’t make it to beyond the sub-district level, but that only inspired me to learn more about web designing and other technical stuff. During my higher secondary studies, I didn’t get much time for blogging. My parents forced me to concentrate more on studies since they have great hopes on me. Also, there was no proper internet connection available. I was using 2g internet data connection at that time. These all delayed my works. But ultimately now I am managing more than 4 blogs at a time. I didn’t do anything extraordinary. I just continued doing my works and learning. If something helped me in overcoming above challenges, it is my Mother and the web world. I mostly use Google’s services. The tools I recommend for bloggers are Google Adwords Keyword Planner, Grammarly app [online], Google Webmaster tools, Google Analytics, Semrush and online picture resizing & compressing tools. Wasting lots of time before making a decision. Do smart work and be unique in your own ways. And there are no shortcuts to success. Don’t be impatient. You will not get the results instantly. Be patient and continue doing the smart work. If you have a strong determination to learn & are ready to accept failures then everything is possible. Currently, I am doing my B-tech course in Computer Science. After my studies, I will start a Web Development and SEO Company and will also take techintor.com to the next level. I would plan everything neatly and instead of waiting for an opportunity, I will make opportunities.